Custom Brackets PRO-E Camera Rotation Bracket with Universal Camera Plate is an ergonomic mounting option for a camera and a flash unit or LED light (rentable separately). It allows you to rotate the camera around the center of the lens axis and locking it in vertical, horizontal, or any position in between. The flash remains stationary. 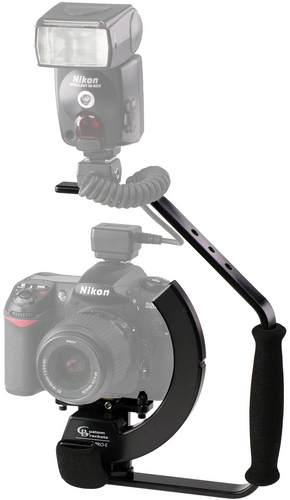 This bracket is compatible with almost all DSLR cameras with or without battery grips. This bracket is a good option for wedding and event photographers. To use this product with traditional Nikon or Canon flashes, you will need the off-camera flash cable for Nikon or the off-camera flash cable for Canon unless you opt to use PocketWizards or optical triggering or you are using a constant light source. Please note that there may not be enough clearance between the top of the bracket and your camera to mount a PocketWizard on the hot shoe.